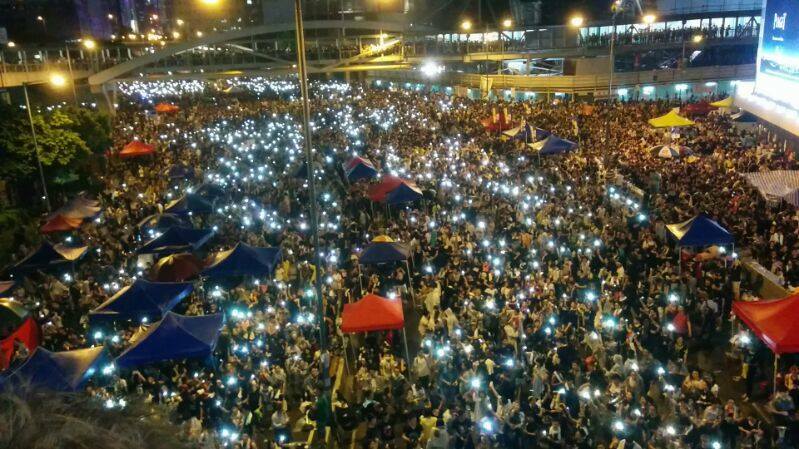 A social messaging app that allows users to contact each other even if a mobile phone network is overloaded or switched off has become a hit among tens of thousands of Hong Kong protesters. Student leaders called on followers over the weekend to download FireChat, which allows phones to communicate even when the Internet is down, after rumours swept their camp that the city’s beleaguered authorities might turn off the cell network. Tens of thousands have occupied major thoroughfares in the semi-autonomous southern Chinese city and have refused to move until China grants genuine democracy. So far the cellphone network has not been deliberately switched off. But protesters quickly found that the app often worked much better than rivals within the huge crowds that have paralysed parts of the city and often overloaded the network. “I know it can connect with people around me without using the Internet,” 18-year-old student Audrey Chan told AFP as she gathered with fellow demonstrators in the busy Causeway Bay shopping district. “There have been groups on Facebook that suggest people download it, during really critical times when the Internet is down,” she said. Launched in March, FireChat works by allowing phones to connect with each other over short distances even if a network is down through their Bluetooth connections. The more phones there are in the vicinity, the wider the distance messages can travel — making it an ideal communications tool for mass gatherings. San Francisco-based company Open Garden, which owns the app, said 100,000 new users signed up in Hong Kong on Sunday alone — a day when police repeatedly fired tear gas at demonstrators and sparked outrage. The company has regularly posted messages on its Facebook account aimed at Hong Kong protesters. “We hope FireChat will serve you well. Please remember messages are not encrypted at this point. Please be cautious about what you say and do not use your real name,” one recent posting read. Many activists said they were still afraid that city authorities could close down the cellphone networks if protests intensify — and felt relieved they would still have a way to communicate. “I’m afraid that the government will cut down the network and I want to make sure I have a point of contact with my family,” said 17-year-old student Sarah Chan.